takes a curious look at the history, physicality and personalities of the tuba - an amazing, if unheralded, horn. The Tennessee Tech Tuba Ensemble is the most recorded musical group of its kind in the world. TUBA U: Basso Profundo follows the story of an unusual 22-piece ensemble into the studio, across four decades, and into renowned Carnegie Hall. Featuring tuba maestro R. Winston Morris, Pulitzer Prize-winning composer Gunther Schuller, German tuba makers, and the 100-piece Tubas of Mass Destruction, this is an anatomy of one instrument that speaks to the dedication in players of every instrument. This offbeat documentary assures us that some unusual things are indeed worthy of a lifetime commitment, dispelling assumptions of size, value and ability while addressing prejudice - even if a very quirky one. Written & directed by EMMY award-winning producer Todd Jarrell, TUBA U: Basso Profundo examines the history, physicality and personalities of the tuba - an amazing, if unheralded, horn. 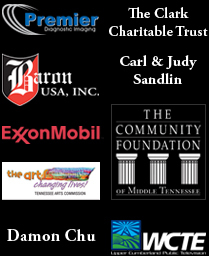 is presented by WCTE Upper Cumberland Public Television and distributed via the PBS National Program Service. Click below to view more clips from this extraordinary documentary.